May 8th, 2017 - // lost on the web. Here is this week's News Zero. Japan has been hit with a serious case of fires, so ichimen is about that this week. Ralph-san is back with nerd jokes for his favorite caster, and it's the last time (I hope) I bore you with the French elections (thankfully, no Frexit to come). Also, Murao-san was not on the set because he was reporting live fom Seoul. 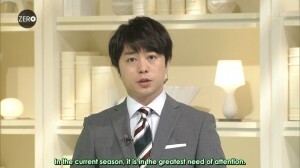 Thanks as always to "Arashi English translation" for letting me use her work, please support her by visiting her Facebook page. You can also follow me on Twitter to get updates on the subs. This page was loaded Apr 19th 2019, 4:27 am GMT.